Thought I was really talented. Lol I'm autistic JK I mean artistic. if you are a talented painter from England.. then maybe you are autistic.. would that be the pronounciation ? Born without a clue or no sarcasm gene? I knew someone who died and they didn't even "have" autism. Sarcasm isn’t a gene. And I knew someone who died too. I have sarcasm in my genes right now. Everyone you ever knew will die. That's not sarcastic but it is genetic. This meme is autistic bruh! WHEN I WAS KID, I THOUGHT "AUTISTIC" WAS A FANCY WAY OF SAYING "ARTISTIC". 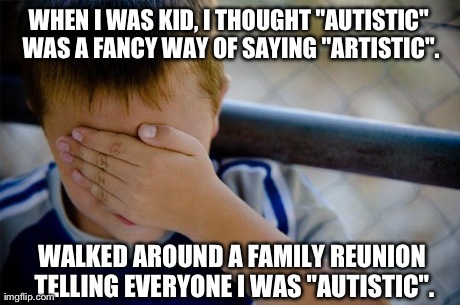 WALKED AROUND A FAMILY REUNION TELLING EVERYONE I WAS "AUTISTIC".